We can provide an entertainment package to suit nearly any occasion. See below for some options. This package is great in its simplicity. It is very flexible, we can keep it low key and provide background music or get the party started. We have provided music for many corporate events and parties in this format. This is the most popular package for weddings. We start the night with a couple of acoustic sets before picking up our electric guitars for the last 2 sets and getting the dance floor pumping. We use our own custom made backing tracks, and with our top of the line PA and lighting equipment any space can be turned into an awesome party. If you want the full rock and roll experience with all the bells and whistles, then this is the package for you. We play with extremely high quality musicians and put on a spectacular show. Package includes 2 guitars, bass, drums, and 3 vocalists. We can also add a 5th or 6th piece to the lineup – keyboards or saxophone are popular additions. Get the best of both worlds with this versatile event package. 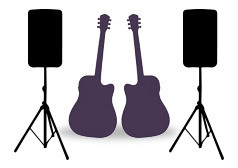 Start the night with our acoustic duo and then kick the party into over drive with our DJ service. You can help design your own playlist, and take advantage of our top of the range PA equipment and lighting rig. We also have a projector show* available with this package. Get in touch today to discuss your event! *Projector not suitable for all venues.